Jurgen Klopp says his Liverpool side will “go to win” their Champions League quarter-final second leg at Porto, despite holding a 2-0 lead. 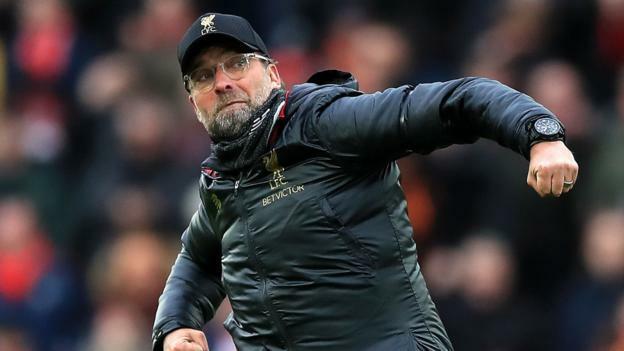 The Reds cruised to victory in the first leg at Anfield but the manager says his players will “fight with all they have” to reach the semi-finals. “We are in a good moment, we want to play football and we want to fight hard,” said Klopp. Victory will see Liverpool make the last four for the second consecutive season, but Klopp expects Porto to be a “different animal” at the Estadio do Dragao. “They always have a high intense game in the highest intensity atmosphere,” added Klopp. “From the first kick, they will go with a clear direction. “If we were 2-0 down and going into the home leg, would we think we were out? No way. Centre-back Lovren started in the 2-0 victory in the first leg but misses the trip to Portugal with illness, although Joe Gomez is available after recovering from a leg fracture sustained in December. “Dejan had a bad night, the doctor was there and he had no chance to travel,” said Klopp. “If you feel not well and had a bad night, we all know an intense game the day after doesn’t exactly sound like the thing you should do. “We have Joe [Gomez] so we should be fine for that position. “Pretty much all the rest are travelling,” added the German. Porto will be boosted by the return of two players from suspension, with defender Pepe and midfielder Hector Herrera available again after sitting out at Anfield. “Pepe and Herrera are coming back and they are key players,” said the Klopp. “Having a centre-half and number six o number eight back is massive for them. Two of the three teams that lost their first leg by two or more goals in the last 16 of the Champions League this season managed to turn around the tie in the second leg; Manchester United knocked out Paris St-Germain and Juventus defeating Atletico Madrid. Porto suffered their heaviest home defeat in European competition against Liverpool in last season’s Champions League, with the Reds winning 5-0 in a last 16 tie. Porto have lost the first leg of a Champions League/European Cup knockout tie by two or more goals on six previous occasions, and on all six of those occasions they have been eliminated from the competition. They are the only remaining side in the Champions League to have won 100% of their home games in the competition this season (4/4). Indeed, Porto last won five or more straight home games in the competition between October 1998 and December 1999 (run of six). Moussa Marega has scored in all four of FC Porto’s home Champions League matches this season. Since the start of last season, Liverpool have won three of their four away Champions League knockout games, only losing to Roma in last season’s semi-final (4-2). Liverpool have progressed from all nine of their previous two-legged European ties under manager Jurgen Klopp (four in the 2015-16 Europa League, one 2017-18 Champions League play-off and four Champions League knockout stage ties since the start of last season). Sadio Mane scored a hat-trick for Liverpool against Porto in last season’s Champions League; only Luiz Adriano (against Bate Borisov) and Cristiano Ronaldo (against Atletico Madrid) have ever scored more than one hat-trick against an opponent in the Champions League, while no player has ever scored two away from home against one club. Since the start of the 2017-18 tournament, Liverpool striker Roberto Firmino has both scored and assisted in five different Champions League matches, more than any other player in this time.